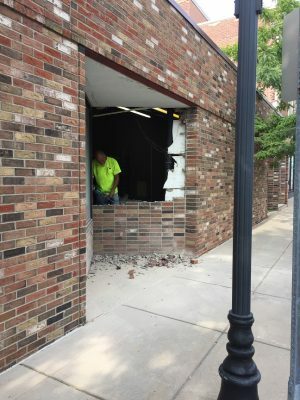 Brick by brick the wall slowly comes down to make way for a new window and wall flush with the street in the new Community Arts Center in Fulton. 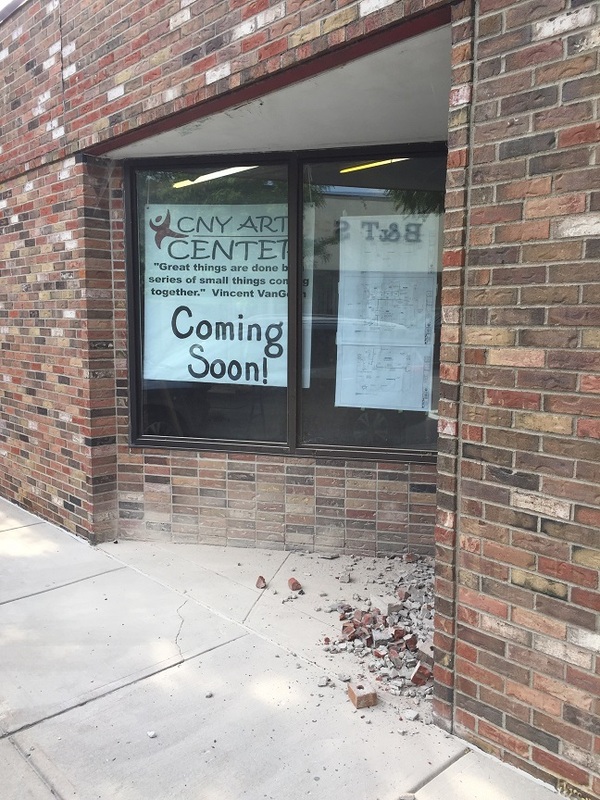 The building is undergoing renovations to provide arts programming and events for CNY Arts Center. For more information visit CNYArtsCenter.com or call 315-598-2787. FULTON – CNY Arts Center is exciting to share progress being made onsite at the new Community Arts Center where it finally ‘broke’ ground this week with the first brick coming down and the front of the building was redesigned. The first bricks hit the ground as work begins on the new Community Arts Center in downtown Fulton. The building is being renovated to include a 100-seat theatre, classrooms, art gallery, teaching kitchen and more. For more information visit CNYArtsCenter.com or call 315-598-2787. An architectural feature in the front façade absorbed valuable interior floor space. With the redesign of the wall, the center will have a new wall and window flush with the street. This opens the floor inside to accommodate audience seating in the new theatre, which is estimated to seat 100 people. Work has also begun on the big stairway in the middle of the floor, working to carefully remove and relocate it to a friendlier spot to reach the balcony. This massive job will also open the floor for audience seating and the wall dividing theatre from lobby with a grand theatre entrance. The one big wall that must come down inside to make room for the stage is scheduled for removal in the first week of September. The wall was found to have a trace of asbestos in the joint compound and the project is being handled by a local abatement company. Once the wall is gone and space cleaned up the stage can be put in place where the wall was. The three-level sprinkler system is scheduled for installation by mid-September. The group has planned several fundraising events including a chicken BBQ, yard sale and arts market with art vendors on September 8 from 9 a.m. – 3 p.m.
Because of the abatement project, the event will run out of the current Arts Center Hotspot at 47 S. First St., across from the gazebo and continue around the corner to the sidewalk in front of the new Community Arts Center at 121-125 Cayuga St.
For more information, visit CNYArtsCenter.com or call 315-598-2787.